Do you remember the "e-e-gamma-gamma-met" event ? I am sure you do not. It is an incredibly striking event that appeared toward the end of the Tevatron Run I in the CDF data. One event that was so incredibly striking, so impossible to produce through standard model processes, that many in my experiment felt sure that it was going to be the portal through which we would enter the realm of Supersymmetry, or other fancy new physics scenarios. I am talking about the CDF experiment at the Tevatron, one of the two such endeavours to which I devote my research time. CDF collects 2-Tera-electron volts collisions between protons and antiprotons provided by the Tevatron synchrotron located at the Fermi National Accelerator Laboratories in Batavia (IL), near Chicago. And it does so since the mid eighties, thus qualifying as the most longevous physics experiment humans ever ran. "The total rate is 1 x 10^-6 events, with the dominant sources being WWgammagamma (8x10^-7 events) and WWgamma jet (8x10^-8 events). Removing sources where the plug cluster is due to a real electron, the rate is reduced to 6x10^-8 events [...] We emphasize that while these SM estimates are small and have led to valuable speculation, it is indefensible to claim evidence of new physics based on one peculiar event selected from 3x10^12 events." I remember frantic email exchanges among my collaborators when the event appeared on the scene, and the hypotheses put forth to try and reconcile it with standard model sources. The event was really baffling: even admitting that the least-well identified of its two electron candidates -one landed in a region not covered by the central tracking chamber, "the plug cluster"- was a much less extraordinary hadronic jet, the event retained a halo of incredible mystery. Above, you can see a "lego plot" of the event candidate, straight out of the original publication which described it in detail (another one published the previous year also discussed it; references upon request -I am uncharacteristically lazy today). To understand the meaning of the graph, imagine you represent the CDF detector as a hollow cylinder, rolled around the line along which protons and antiprotons enter in opposite directions. When a collision occurs, particles will exit the center of the detector, hitting the cylinder in different spots, and depositing there their energy. If you now cut the cylinder along a line parallel to the beam axis, and unroll it on a table, you get a view like the one above. The "azimuth" is the unrolled coordinate, while "pseudo-rapidity" is a complicated quantity, but essentially a monotonous function of the angle that particles make with the proton beam. A pseudo-rapidity of zero means that the particle left the collision region orthogonally from the beams: these are the most interesting particles, because they carry most of the information about the hard collision, just like the debris of a head-on car crash flown away from the road is the one which received the largest boost. And now: the purple bars represent deposits of energy in the calorimeter, which measures electrons and photons. The latter are distinguished by the absence of a track pointing to the calorimeter deposit. As you can see, there is little or no "hadronic" energy -which would be shown by blue bars-, indicating that the event mainly produced these four energetic objects (the height of the bars is proportional to the transverse energy they possess). And there is a fifth object (at least): something that left unseen, carrying away 55 GeV of missing transverse energy, in a direction which can only be guessed on the azimuthal axis (its pseudo-rapidity is undetermined). More than a colleague was won over to Supersymmetry by looking at that event alone. And rightly so, in a sense: new physics is bound to appear first as a rare phenomenon, before more data, and higher-energy events, are collected and analyzed. Many reasoned that, just as we had seen one striking top-antitop event candidate in the whole bounty of CDF Run-0 data (the events collected in a early, low-luminosity 1987-1988 run), but had been unable to claim a discovery of the top quark with it, we would be stuck with the ee-gamma-gamma-met event for a while, until more similar events would appear in higher-statistics datasets. A paper which I have just finished reviewing -as part of my duty of internal reviewer of CDF publications, as member of the Spokespersons Publication Review Group- deals with answering the question posed by the infamous odd Run I event. Of course, as happens with all but a few CDF publications, by the time a paper is ready to be submitted, everybody already know its contents, by having heard about them at physics conferences around the world: because of that, what I am writing here is not new to those of you more interested in exotic physics. Nevertheless, I thought it was a good idea to publicize the result. So what does CDF finds in a signature-based search of "odd events" characterized by possessing two energetic photons plus anything else, where this anything else must be energetic enough to make the events more interesting than ones just containing two photons (which by itself is a quite rare, but not altogether too interesting, signature at a hadron collider) ? Well, unfortunately nothing much. CDF searched for diphoton events and then looked in the set for additional energetic objects characterizing the signature: one electron, or a muon, or a tau lepton, or a jet, or missing transverse energy. This defined several different datasets which were studied independently, by trying to determine whether the observed rate and kinematics were consistent with standard model expectations. Guess the answer: nothing disagrees, in a dataset twenty times larger than the one where the original e-e-gamma-gamma-met event made its apparition! Sure, there are quite a few very interesting events. But particle physicists have become wary of zoology. The moment one sets out to pick individual events in search for uncommon features, the damage is done: something odd is bound to be found. Instead, the correct approach is to address the matter statistically. Do we see a rate of events with these generic properties matching expectations, or not ? That is the relevant question, which is much more foul-proof. Foul is what statisticians call a "Type-1 error": rejecting the null hypothesis ("the standard model is correct, and there is no new physics signal in the data") when in fact it is the true one. I could show in this article a large number of histograms, describing the kinematical properties of the handful of isolated events. But I this time prefer to avoid doing so. The reason is that we really do not learn much from those distributions, for two reasons. 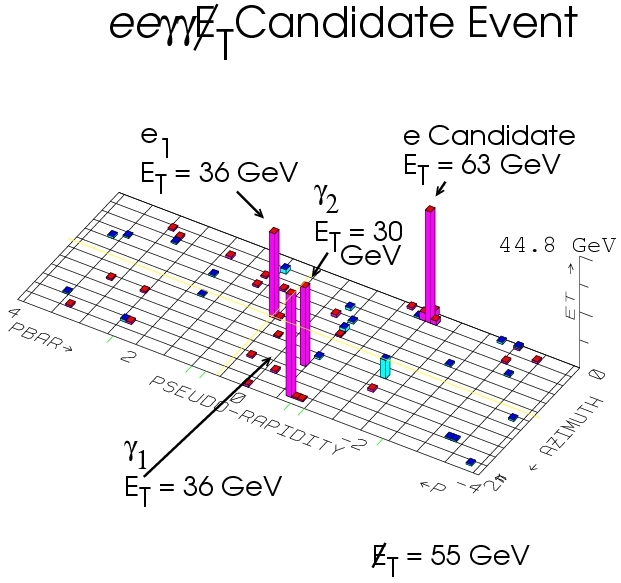 First, because the statistics of the remaining candidates is very poor once two photons and a third energetic object is selected - and thus the data distributions are compatible with anything. Second, because there is no model to compare the data to! In fact, this was a real signature-based search, which embraced the possibility to detect an anomaly in rates or distributions, without sticking to any particular new physics model to rule out. But a lack of a reference model for new physics means that we do not have much to report: this was really an all-or-nothing endeavour, in the sense that contrarily to what usually happens in a search for exotic processes, we cannot set any specific limit on the cross section of new physics models, nor mass bounds for new particles. Nothing. I was about to paste here the conclusions of the paper to make my point stronger, but unfortunately, hehm, the paper is not published yet! Anyway, the conclusions are that no new physics is seen, that data agrees with expectations, and that no event even vaguely similar to the e-e-gamma-gamma-met one of Run I appeared in a 20-times-larger dataset. 2) the eeggmet event of Run I will remain an oddity, joining other unexplained, eventually irrelevant, effects encountered by physicists in their investigations of subatomic physics. A Lusus Naturae. 3) You are now morally bound to read the paper when, in a week or two, it will appear in the Arxiv. Mind you, it is quite long. I can only say I am proud that I reviewed it in the course of an evening, a sign that my speed-writing skills have reached master level.